*From the February 2, 2004 issue of New York Magazine. Don’t mind the balloons,” Kathie Russo says, brushing a few helium-filled strays from the doorway as she swings open the door into the kitchen of the rambling Federal-style house in North Haven she shared—or perhaps shares—with her husband, Spalding Gray. “We’re having a party. If there’s anything abnormal about the mood at this two-story white clapboard home, it’s the normality. It’s not a funeral. It’s not even a wake. It’s just a void, and an eerie one. A rabbit named Thumper sits in a cage on the dining-room floor, ignored by the children since the family bought a miniature Australian Shepherd puppy, named Bowie, in a half-successful attempt at “pet therapy” for their dad, who had been seriously—even publicly—depressed since he was injured in an accident two and a half years ago. At a small breakfast nook off the kitchen, Kathie’s parents sit, her father stoically reading the Times. “How’s this?” asks Forrest, 11, who strolls up wearing a White Stripes T-shirt, showing off a pink-and-green Easter basket filled with presents he’s wrapped in blue for his brother. “For his birthday, Theo wants anything British. He is completely into the Revolutionary War,” Russo explains. “Last night I made cupcakes with a British flag on each. He’s a total history buff at age 6. This morning, the detectives from the city were out again to give her an update, such as there was. Since the news broke January 12, the police have received more than 200 tips. Spalding was spotted in Beverly Hills; someone else saw him in Macy’s. He left his wallet behind at the couple’s Soho loft, true, but he did have $120 cash on him. One tip, from an ex-detective and published in the Times, had Spalding haggling with a waitress over a window seat at an Orange County diner. Russo promptly dispatched her parents to the diner, whose owner ended up poring over recent tapes from his security cameras. No Spalding. Gray had spent the past 31 months laboring, only partly successfully, to recuperate from a devastating car accident in Ireland in June 2001. In the crash, Gray, who had always battled his hereditary depression and bipolar tendencies, suffered a badly broken hip, leaving his right leg almost immobilized, and a fracture in his skull that left a gruesome, jagged scar on his forehead. Shattered both physically and emotionally, he had spent the ensuing months experimenting with every therapy imaginable. In just under two years, the celebrated monologuist underwent six operations and passed through twelve hospitals. There was virtually no psychoactive medication Gray had not tried—Prozac, Celexa, Paxil, Depakote—and usually, under doctors’ orders, in extravagant combinations. He tried aggressive acupuncture. Nothing worked. And he might. Conceivably. The last his family saw of Spalding was Saturday, January 10, when he took the kids to see Big Fish, the story of a dying father’s relationship with his son, at the Loews Village on Third Avenue and 11th Street. After the movie, Gray wept. Gray had openly talked before about killing himself by jumping off the Staten Island Ferry, which he rode often just to relax. On the day before he went missing, he had been observed by ferry staff placing his wallet on a bench and wandering ominously over to the railing. He was later escorted off the ferry by security guards. There had been other ostensible attempts at suicide, too, other notes. Since September 2002, there were three official attempts—such as the time he paced the bridge connecting Sag Harbor to North Haven, hyperventilating and balling his fists until he was talked down—and numerous other moments when Gray apparently flirted with his own death. But Gray always left word of his intentions and he didn’t seem to care who received it. At one point last fall, he left a message on the home answering machine, telling his family he intended to jump from the Staten Island Ferry. More than once he left notes on the kitchen table, one of which was discovered by Forrest. But this time, nothing. “It’s so unlike Spalding not to leave something,” says Russo. True, there was an eerily arbitrary trip into the drizzly chill to “buy stationery.” When Gray failed to show up by Sunday morning, Russo fully expected to receive a note on that same stationery. Rushing out to North Haven on Monday, she began to dread the mail’s arrival. Two days passed. Four. Still nothing. That was Friday. By Tuesday, the detectives were back on the phone. No less than four credible witnesses reported seeing Gray riding the ferry on Saturday, around the time he vanished. Equally depressing, police had traced the last phone call Spalding made to the boys to a pay phone at the ferry terminal. Russo, recounting these latest developments, was clearly holding back tears. “I feel, in my heart, that he has died. I’m trying to accept it now,” she says, trailing off. The playback of that tape started droning in a distinctly minor key from the very outset of the calamitous Ireland trip. The vacation started well enough. Gray was friendly with John Scanlon, the Falstaffian public-relations legend, who summered in Sag Harbor but also owned a glorious house in Ireland that he routinely lent out to his writer friends. Gray and Russo had an open invitation to take the house, and for Spalding’s 60th-birthday party on June 5, 2001, Russo surprised him with airline tickets. The gloom wouldn’t lift. The first afternoon, the group toured an ancient monastery, discussing death, and while driving to dinner at the late Scanlon’s favorite local restaurant, the Wine Port Lodge, that night listened as a doleful announcer read obituaries of local citizens over the radio. “We must have spent half the dinner that night talking about Robert Hughes’s motorcycle accident and how terrible it would be to get into an accident in a foreign country,” Tara Newman, a Sag Harbor broker and one of the party, recalls. For the trip home that night, Russo, who had drunk only one glass of wine, took the wheel of the car, which had been rented by Timothy Leary’s widow, Barbara Leary, and her South American boyfriend, Kim Esteve. No one in the backseat used a seat belt. Minutes later, Russo was headed down a country lane so narrow that two cars could barely pass each other when she saw a pair of headlights rounding the bend toward them, at first obscured by a tall hedgerow. She pulled to a stop at a bend she later learned the locals call “The Black Spot” owing to the number of serious accidents that have occurred there. She prayed that the minivan, coming straight at them, would see them and stop. It didn’t. The impact was explosive, thrusting the engine of the rental car into the passenger compartment, where it burned Russo’s arm. All five people in Gray’s car were knocked unconscious, except for Tara Newman. The van, it turns out, was driven by a local veterinarian who had been carrying a tank of mad-cow medicine, which was oozing all over the road. Gray spent the next week in a local hospital, where care was less than cutting-edge, to say the least. To treat his crushed hip, Gray was issued a brace that dated to the Eisenhower era. He would spend another three weeks at a larger hospital in Tullamore before coming back to the States. In place of the amusing old neurotic tangents, an alarming bitterness crept in. “He was always saying to me, ‘Why was I the only one hurt? Why weren’t you hurt, too?’ ” Tara Newman says. Everyone, including Gray, was shocked by the transformation that overcame the self-absorbed artist the first time he and Russo held Forrest in their arms. Fatherhood sparked a reevaluation of who he was. He was even—gasp—content. “The Green House, that’s where he spent the happiest five years of his life,” says Dale Scott. But after the accident, Gray’s ruminations on the Green House were “definitely obsessive-compulsive,” says Robby Stein. This struck friends as odd, since the new North Haven house was only a mile away and larger with a big yard for the kids. But the old house was a symbol. Gray was now too infirm to walk even that distance. “He had to learn to walk again,” says Russo. He never did lose the brace on his right leg, or his limp. “He was in a psychotic state,” adds Robby Stein. At many dinner parties, Gray would pace—silent, agitated—as other guests tried to eat. “We’d be at the table, and Spalding would be up doing laps around the first floor of my house,” recalls Dale Scott. The cosmic connections continued: He was spooked by the fact the driver of the minivan in Ireland had the same name as the real-estate broker who had sold them the North Haven house and he started wondering aloud if another broker, who had once approached Gray about selling the Sag Harbor house, had put an evil spell on him. A cerebral, restless youth, Gray aspired to become a novelist. After graduating from Emerson College, however, he shifted his focus to theater and decided to lay the groundwork for a career as an actor at a regional theater in Houston. “It was horrible,” he later recalled. “People would call up the theater and say things like, ‘We want seats tonight, but not next to no Negroes.’ ” Desperate, he decided to confront New York, the town that had both beguiled and terrified him. “He was the first actor I knew who was working with his persona as a meta-persona,” says Kate Valk, a Wooster Group member. “He was so interested in his own persona and exploring that.” By 1979, Gray had essentially minted a new medium to fit his talents—the autobiographical monologue. “The monologues were Spalding’s very creative way of processing a very messy, distressing, chaotic life,” explains Shafransky, who met Spalding in 1979 when she was a film critic for the Village Voice. “He used to say that making monologues was like the fairy tale “Rumpelstiltskin,” that he was spinning garbage into gold. I’d say it was more like he was spinning sadness. To most ironic, existential New Yorkers, this in itself seemed like Gray’s ultimate insulation from mental collapse. He was in touch with his feelings. He wasn’t just another time bomb of New England Protestant repression, ready to blow. That had been his mother, Margaret Gray, who was 52 in 1967 when she closed the garage door and turned on her car engine. But Spalding was surely protected from that by living a life of public self-analysis. In June 2002, succumbing to an ever-worsening despair, Gray checked himself into Silver Hill, a psychiatric hospital in New Canaan, Connecticut. Two months after his release, while riding on a ferry to Martha’s Vineyard, he confessed to a friend that he was tempted to throw himself overboard. In September of that year, he was talked down from the bridge connecting Sag Harbor and North Haven. He was then committed to hospital. Though the couple’s insurance covered only six weeks, he stayed for four months. The treatment was to no avail, and Russo continued to seek out experts throughout New York City. “They all would basically spend ten minutes and send him on his way,” she says. As new medications and new therapies failed, the downward spiral continued. “You name it, he’s been on it. Antidepressants. Antipsychotics. He was on Depakote the first time he tried the bridge. He was on such a high dosage. He was really out of it,” Russo says. “He would see little improvements on every single one, then he would crash.” But she doesn’t believe they were a significant factor in Gray’s suicide attempts. One afternoon, Gray took a sail alone on Sag Harbor Bay. He jumped overboard, but grabbed onto the rudder. He was resigned—he later told a friend—to letting the current decide his fate. It spared him that time. A year later, Russo was expected at a dinner party at Tara Newman’s former home, an old whaling captain’s house in Sag Harbor. Through cocktails, she hadn’t shown up. Finally, the 25 or so assembled guests sat down for dinner. “Suddenly, Kathie burst in and just said, ‘He’s done it,’ and basically threw herself into Tara’s arms,” recalls writer Michael Shnayerson, a guest that night. “It was like a scene from a Chekhov play, where this woman bursts in stage right with this horrible news. She had planned to meet Spalding at the Jitney stop. When he didn’t show, she checked the messages on her home machine. Spalding had left a rambling message saying he intended to kill himself and ending with something like ‘Please, take care of the children.’ The kids were actually upstairs playing. They didn’t know anything about this. From this point on, friends were uncertain if Spalding’s erratic behavior was a cry for help or a sincere wish to extinguish himself. Even Russo didn’t always know. Last April, Gray wandered into the surf at the beach in Bridgehampton wearing his street clothes. He reemerged disoriented and dripping. “When I saw him, I just said to him, ‘Spalding, what are you doing?’ ” says Russo. The timing of that attempt was curious because, for the first time in two years, there was reason for hope. The first glimmer came last June, when the couple flew to California to undergo a battery of tests at UCLA’s Neuropsychiatric Institute. At last, Russo says, Gray was being treated for a brain injury, not just depression. “The fracture was so severe that he had right-frontal-lobe damage,” Russo says bitterly. “Some doctors said, ‘It’s depression.’ Others said, ‘No, it’s brain damage.’ It’s really a combination of both.” There was even some progress on his right leg. In September, Gray underwent an operation to remove the scar tissue from a damaged sciatic nerve. The prognosis, while cautious—eighteen months to regain mobility—was at least positive. When he returned home from L.A., Gray went to see famed neurologist Oliver Sacks at NYU Medical Center, who told him his injury was so severe, he was looking at five years’ recovery. Sacks’s associate doctors put Gray on Lamictal, an antiseizure medication now popular for bipolar disorder. Unlike the antidepressants, which Russo says would give him a brief boost, then stop working, Lamictal calmed Gray, paving over psychic potholes just enough for him to start working again. This past October, Gray took the stage at P.S. 122, a step many of his friends thought he’d never take again. It was the first performance in a three-month, twice-weekly run of a monologue he dubbed Life Interrupted, in which he attempted to reconcile his travails since Ireland. In tone, it was drastically darker than his last work, Morning, Noon and Night. It was also more labor than labor of love. Gray couldn’t concentrate. Groggy from medication, he couldn’t access his old flights of fancy. Russo called in Stokes Howell, who spent several days each week in North Haven, hunkering down with Gray over a fledgling outline. Still, friends stuck to the script. 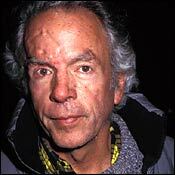 At long last, the Spalding Gray they knew was back. Life Interrupted ended its run on December 15. Over Christmas, Gray seemed to keep the momentum, even traveling into the city alone to pick out an antique garnet ring for Russo. And Russo in turn gave Gray—once an avid skier—a trip to a ski clinic in Aspen. On Friday, January 9, Gray made it to his psychiatrist’s appointment at 2 p.m. About four hours later, he was seen riding the Staten Island Ferry and wandering near the railing by a mate on the boat named Billy Doyle who claimed to have seen Gray on the same ferry a few weeks before. The next morning, Saturday, Gray was scheduled to fly to Aspen. He hoisted his skis into a cab to La Guardia, only to get out there and find the flight was canceled because of bad weather. It was a bitingly cold day, with gray, spitting sleet. He returned to the couple’s Soho loft, and at midday, he took the boys to the East Village to see Big Fish, and then for a late Indian lunch at Haveli on Second Avenue. After dropping them back home, he set out again around 6:30 p.m., leaving the boys with Marissa—Russo’s 17-year-old daughter from a previous relationship, who was babysitting the boys—and saying he was meeting a friend for a drink. Around 10:30 p.m., Gray called home and told Theo, who answered, that he was “just checking in” and that he would be there soon. “Love you,” he said quietly. Gray’s choice of Big Fish is crushing in its poignance. Throughout most of Tim Burton’s film, the character of the son is trying to cut through the haze of his father’s tall tales, dissecting the brilliant myths his father has spun to find the real man within. In the end, however, the son is won over by his father’s imagination. As the old man lies dying in the hospital, he challenges the son to summon his own fantasy of his father’s death—one in which the ailing man strolls down to a riverbank in his native Alabama and, before a gathering of a lifetime of friends, throws himself into the roiling water. Miraculously, the dying man then morphs into a giant fish and swims away and out of sight.